Rain, cold and slippery track: tricky conditions for the second day of the 2018 WSK Final Cup’s third round on the Adria International Raceway. As the curtain unfolded on the Qualifying Heats, we now have a clearer view on who will start at the front for the Prefinals, the penultimate step before the final title-deciders on Sunday afternoon. The Junior class had the privilege of opening the festivities this Saturday morning on an Adria circuit still very much made tricky because of the rain and cold from the day before (check out our Friday report). Despite this, Taylor Barnard (KR-Parilla) managed to grab two wins and two top-3 finishes to secure the top spot in the Junior provisional classification, meaning he will get to start on pole position in the Prefinal A, on Sunday morning. The pole-sitter of the Prefinal B will be Gabriele Mini’ (Parolin-TM), the Italian winning three of his heats. Thomas Ten Brinke (FA Kart-Vortex) concluded his day with two victories in the bag and will start alongside Barnard in the Prefinal A. James Wharton (FA Kart-Vortex), Friday’s fastest driver, couldn’t turn his qualifying pace into wins as he collected three second positions to finish the day in fourth, enough to make him start on the front row of the Prefinal B grid alongside Mini’. Among the other contenders in the spotlight, Nikita Bedrin (Tony Kart-Vortex) added two heats to his tally with the aim of giving Barnard a hard time from third on the Prefinal A grid. Winner of his first race on Friday, the Swede William Siverholm (Tony Kart-Vortex) wasn’t able to match his early good start and ended up in 11th position (6th on the Prefinal A grid). The Prefinal A will start this Sunday at 10:50, followed by the Prefinal B at 11:10, which will result in the composition of the grid for the final race in the afternoon. Here are the grids for the OKJ Prefinal A and Prefinal B. The first Qualifying Heat of the day in the OK class saw Lorenzo Travisanutto (KR-Parilla) and overall pole-sitter Andrea Rosso (Parolin-TM) already facing each other in still tricky track conditions. With one win each on Friday, the face-off turned to the Kart Republic’s driver by 3.6 seconds on the line. David Vidales (Tony Kart-Vortex) finished where he had started, third, in front of Joseph Turney (Exprit-TM) and Dexter Patterson (KR-Parilla). The B-D race was later won by Viktor Gustafsson (Kosmic-Vortex) who got the edge over Nicklas Nielsen (Praga-Parilla) despite the Dane starting from pole. Kacper Szczuzurek (Kosmic-Vortex) came in third, just 0.7 seconds in front of Roman Stanek (Kosmic-TM). Paul Aron (FA Kart-Vortex) finished 5th while his Ricky Flynn Motorsport’s teammate Zane Maloney (FA Kart-Vortex) was forced to retire. In the wake of his first victory, Gustafsson didn’t stop there to grab the win in the A vs. D heat where Rosso couldn’t turn his pole into the result he had foreseen. Félix Arnold (KR-Parilla) joined them for the first time this weekend in the top-3 with Vidales fourth and Aron following in fifth. Finally, Travisanutto made the best of the wet conditions to surprise both Turney and Nielsen who followed the Italian in that order in the B-C race concluding their day. Stanek came close to the top-3 again, preceding Framcesco Pizzi (Exprit-Vortex) in 5th. Thanks to three wins in the bag, Lorenzo Travisanutto secured pole position for the Prefinal A while Viktor Gustafsson will start at the front in the Prefinal B. With nothing to lose championship-wise, the Swede has positioned himself as the unexpected contender to watch heading to Sunday’s Final. Here are the grids for the OK Prefinal A (12:30) and Prefinal B (12:50). 60 Mini: A Russian clean sweep! Already claiming the overall-fastest lap on Friday, Russia’s Alexandr Tibekin (DR-TM) has been absolutely unbeatable in the 60 Mini class, winning all of his five Qualifying Heats to secure both the head of the provisional classification and the pole position for the Prefinal A. His fellow countryman Maksim Orlov (Parolin-TM) has been equally impressive to grab the Prefinal B pole position thanks to two victories and a string of top-3 finishes. 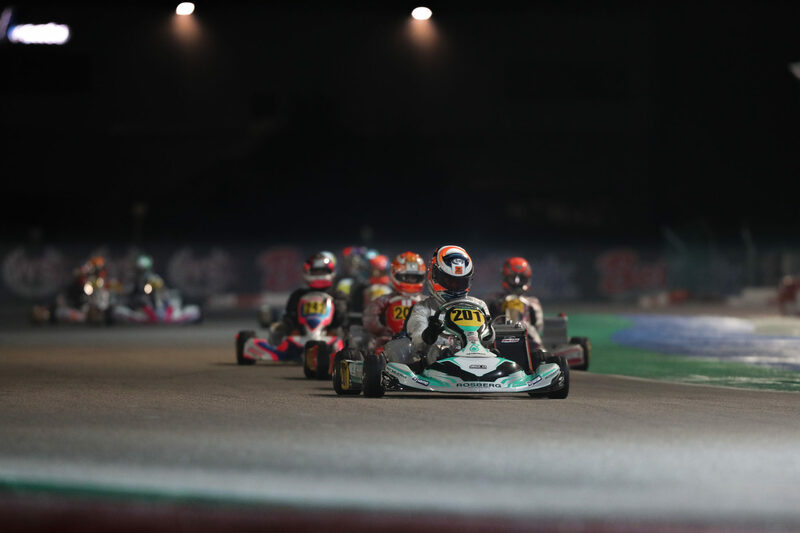 Rashid Al Dhaheri (Tony Kart-Vortex) put himself at the front of the Prefinal A with a solo win (E-F) but a second and three third positions. The American Mateo Rubio Luego (Parolin-TM) concluded his day as the fourth-strongest performer with four top-3 results to grant him the front row of the Prefinal B at Orlov’s side. The same race will see the category’s leader Brando Badoer (Parolin-TM) starting from third on the grid. As his weekend got on a difficult note due to a retirement and a penalty in his first heat yesterday, the son of Luca Badoer, ex-Formula 1 driver, quickly turned things around to win his next four races. Another unlucky driver who got back on his feet was the Belgian Ean Eyckmans (Parolin-TM) who, after suffering a retirement on Friday, managed to finish three times on the podium to secure 7th on the Prefinal B grid. The first of the two Prefinals (A) will start tomorrow at 11:30 with the B following at 11:50. Here are the grids for the 60 Mini Prefinal A and Prefinal B. It has been once again a very fruitful day at the office for Adrien Renaudin (Sodi-TM). After winning the first Qualifying Heat of the KZ2 class run on Friday, the future Sodikart factory driver for 2019 has shown no sign of slowing down by adding the second race to his tally this morning, crossing the finish line six seconds clear off his CPB Sport’s teammate Ariel Levi (Sodikart-TM), who himself had pulled enough gap in front of Emilien Denner (Kalikart-TM). Third then second, Levi kept improving in the afternoon by defeating Renaudin in the last heat, the two being split by eight-tenths of a second. Axel Bengtsson (Kosmic-Vortex) finished this time in third place ahead of Denner while Jean Nomblot (Sodikart-TM) came home in 5th after a 6th place earlier on. In the provisional classification, CPB Sport has logically secured the first row of the Prefinal starting grid with Renaudin on pole and Levi alongside him. With a very-promising 1-2 showdown at the forefront and threats coming from further back with the likes of Denner, third, Bengtsson, fourth, and Nomblot, fifth, the KZ2 Prefinal will certainly be worth keeping an eye on, tomorrow at 12:10, before the title-deciding showdown at 15:00. Here is the grid for the KZ2 Prefinal. The third and final day of the 2018 WSK Final Cup’s round 3 on the Adria International Raceway will kick off this Sunday at 08:25 am with the first warm-up sessions followed from 10:50 am by the first Prefinal A in the OKJ category. Don’t miss the on-track action with the Live Timing and Live Streaming (on Sunday afternoon, Nov. 25th) brought to you by WSK Promotion.